See-Dub: A library is born. It's NaBloPoMo! Nothing like posting every day to make me get around to those old pix that were getting dusty just hangin' out on the ol' hard drive. Tonight's post takes us all the way back to March! 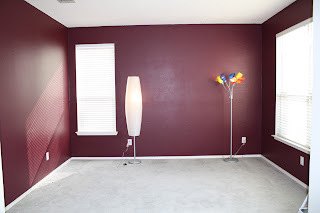 When we first found this house, I noticed that only two rooms had color on their walls: Ryan's room (which required de-arking) and the formal living room. Our friend and agent appreciated the nice paint job in the formal space and commented that this was one room we wouldn't have to repaint. "Um, Tim?" 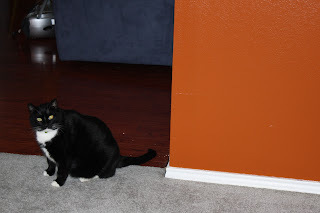 I asked him. "Do you see what COLOR this room is?" MAROON. 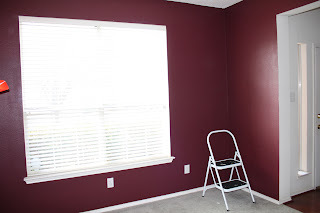 Now some would call it burgundy, but in my sports-addled mind, it was MAROON. Considering this was destined to be my Longhorn Library (a.k.a. 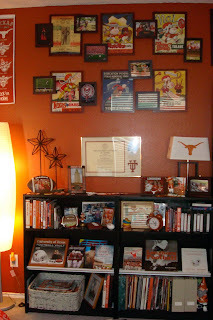 Tacky Texas Room), the rival's color just would not do. So a mere six months after moving in and a couple of gallons of Lowe's paint later, the maroon was gone. It took a good chunk of my spring break, but I got that room painted. 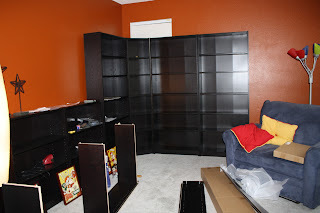 Then it was a matter of waiting for IKEA to get my Billy bookcases in stock. In time we were finally able to borrow Papa's truck and make the big trek to Scandinavia Frisco. Construction was underway—and the room smelled like a lumber mill for weeks! I was really pleased with the corner unit, and with some aluminum foil, I was able to darken the useless window back there. (It overlooks our neighbor's air-conditioning unit. Not exactly a priceless view.) 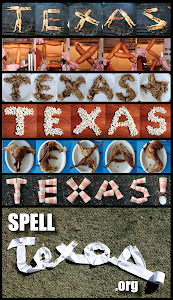 (Besides, if we're going for tacky, shouldn't aluminum foil be involved?) (And don't you hate seeing a bunch of parenthetical statements in a row like this?) 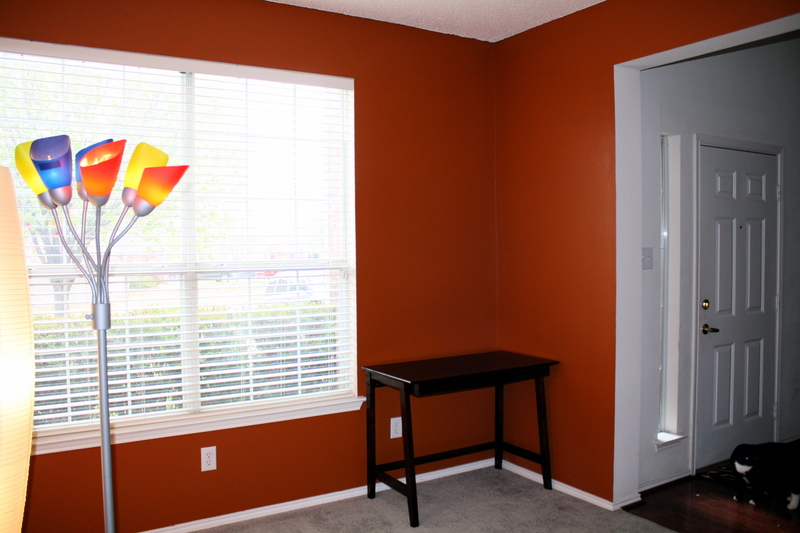 A framed poster helped conceal the window, too. 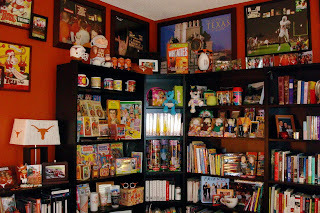 This corner houses my pop culture collection: Brady Bunch, Twin Peaks, Friends, and some of the larger national championship items. A Pottery Barn ad inspired me to try the layered frame look. To pull it off, I used extra long nails and those sticky foam squares used for scrapbooking. 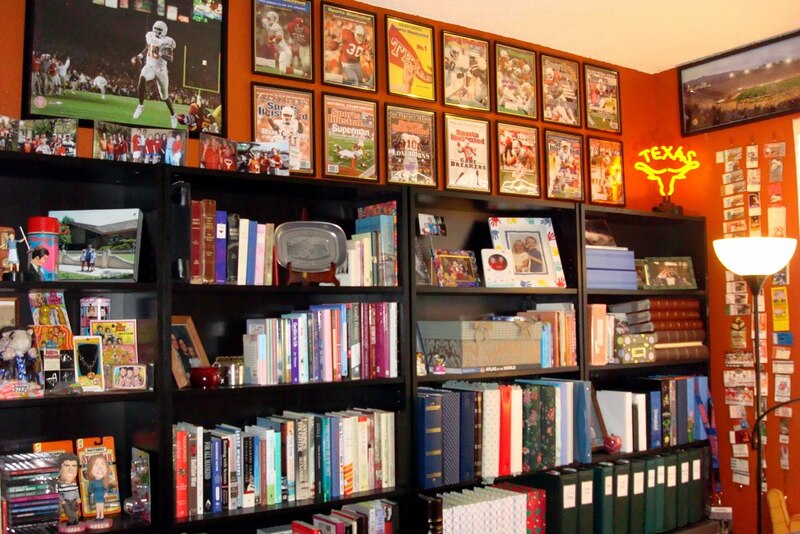 The larger frames, by the way, contain prints of old football programs from calendars. 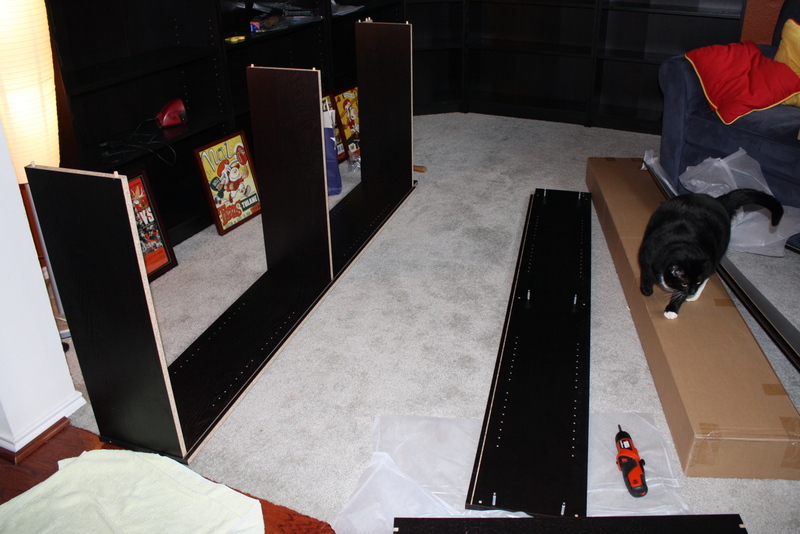 For these shorter bookcases, I bought IKEA's magazine display hardware. 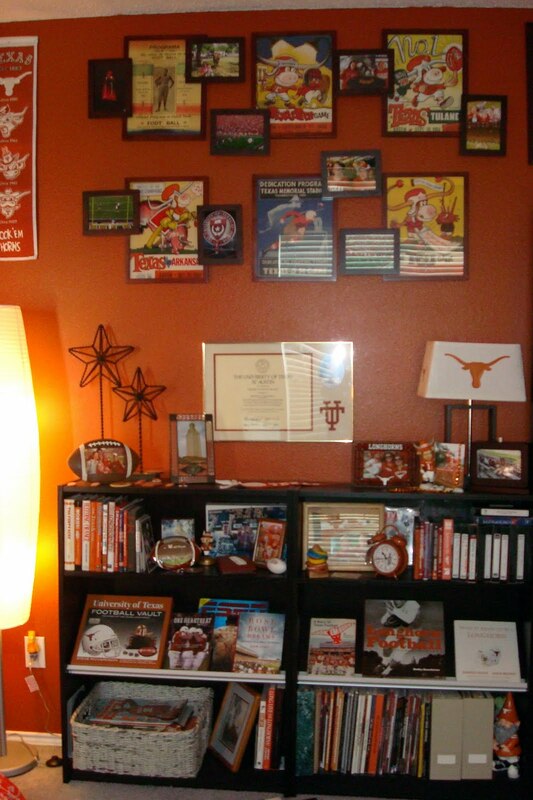 I like the way the tilted shelves let me show off some special UT books. On this wall are some of my "regular" books (the rest are in our bedroom), scrapbooks, photo albums, my favorite Sports Illustrated covers (Thanks, Mike! ), and special ticket stubs. 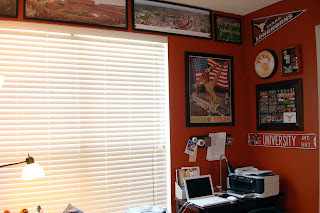 This window is topped with panoramic pictures of the Rose Bowl, Cotton Bowl and DKR (with a photo from the '09 Fiesta Bowl thrown in for good measure). 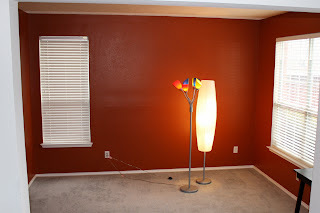 That corner also houses my laptop desk and printer. Finally, my computer stuff has a home—a real one, and not just the floor of the living room! Below the window are drawer units for storage. 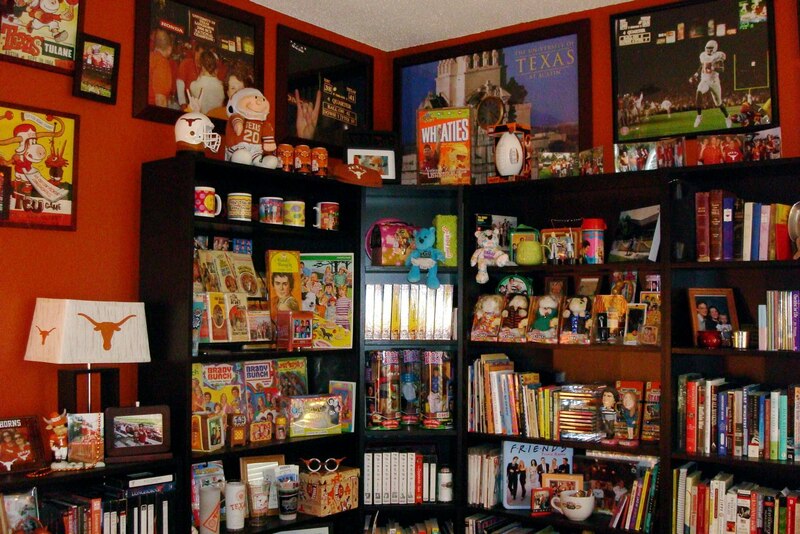 I know it's not typical for a formal living area to be Texas Tackified, but it fits our collector/pop culture crazy style. And when I need to get away to work on Sunday stuff or read, this room, covered with fantastic memories, makes me feel at home. Finally.